Syllabus of the Online Course (Subject): Human Rights in Islam. Cairo Declaration. The “Universal Declaration of Human Rights” United Nations (1948) has been very criticised by many Muslims especially from Sudan, Pakistan, Iran, and Saudi Arabia, because does not take into consideration the cultural, religious and historical reality, not only of Islam but all the non-Western countries, and therefore they classify it as a declaration of the West. Some Muslims even believe that this declaration is not compatible with the Sharia. Many people have described as a response of Islam to the West. 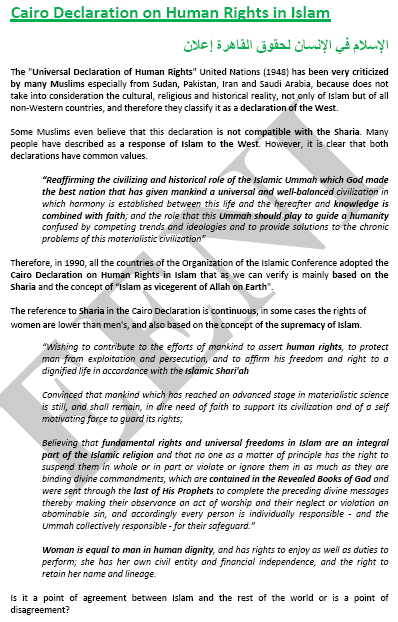 The Cairo Declaration on Human Rights in Islam is a guide for all the aspects of life. The reference to the Sharia in the Cairo Declaration is continuous, in some cases, the rights of women are lower than men's, and based on the concept of the supremacy of Islam. “All the rights and freedoms stipulated in this Declaration are subject to the Islamic Shari'ah.” (Article 24). The family is the pillar of the society. The non-Muslims living in Muslim Countries with the implementation of all, or part, of the Sharia can considerer it as a cut of their fundamental freedoms. The Universal Declaration of Human Rights can be considered as universal or as Western-Christian, and the Cairo Declaration as Muslim. There is not any Hinduism or Buddhist declaration. However, it is clear that both declarations share common values.